Set in the verdant upcountry and surrounded by towering pines, this resort is reminiscent of a country manor, offering estate activities such as golf, horseback riding, sporting clay shooting, croquet and lawn bowling. Its 102 luxurious rooms and suites some with a stone fireplace offer residential style furnishings and colorful décor that are inspired by the natural surroundings. 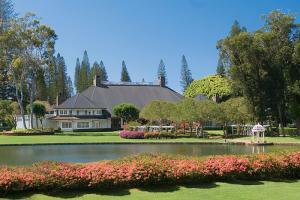 In the central highlands of the island of Lanai, approximately 10 minutes from the Lanai Airport. Golf, Tennis, Water Sports, Hunting, Horseback Riding, Hiking, Mountain Biking, and Exploring By Car.